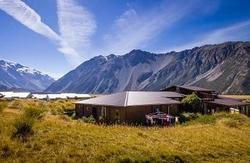 Located in the heart of Aoraki Mount Cook Alpine Village in the Aoraki Mount Cook National Park, this is a 'must do' for your NZ itinerary. We have a great range of quality accommodation options to suit all budgets and tastes. All rooms include ensuite bathrooms, quality linen, refridgerator and a patio or balcony so you can soak up the stunning mountain views. Chill out in the Chamois Bar & Grill, a favourite of travelers and locals alike. Enjoy pub style meals at great prices then party till late or watch the game on the Big Screen. 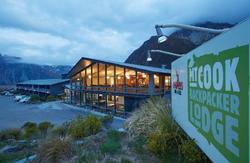 NZ's most scenic Backpackers! Take State Highway 80 to Aoraki Mount Cook Alpine Village, once you reach the village turn left into Bowen Drive and then take the first right into Mount Cook Backpacker Lodge.